Behold! Gallopin' Gaucho, the second cartoon in the original Mickey Mouse series of shorts from the late 1920's. The Mickey you see here is probably not the one you're familiar with. To the surprise of many people, this very first version of the iconic mouse was a mischievous, amorous thrill-seeker with an unquenchable thirst for danger, not to mention a refreshing alcoholic beverage every now and then. Far removed was this primordial mouse from the goody-goody two shoes we now know, whose overall presence has been limited to childrens toys and baby outfits. However, a man named Warren Spector plans to bring his less family-friendly attitude to the surface, whether the public wants it or not. And going by most of the reactions I've heard, we want it pretty badly. Epic Mickey (yes, that's the name) is the latest undertaking for good old Mr. Spector, whose resume includes the much revered Deus Ex series. 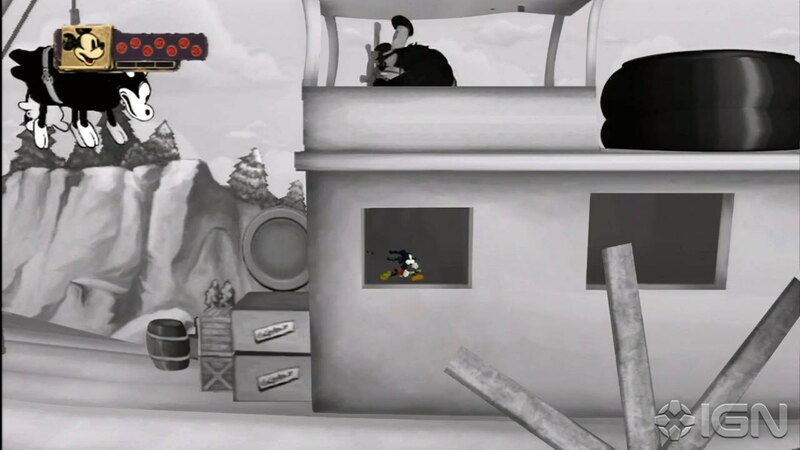 It is a Wii platformer that pits Mickey in the grim and grimy Cartoon Wasteland, home to many forgotten Walt Disney creations like the notorious pre-Mickey Disney mascot Oswald the Lucky Rabbit. The latter isn't exactly thrilled that he's been usurped in popularity and importance by his younger half-brother Mickey, and not surprisingly, will serve as the main villain of the game.....if you want him to. Not unlike many other titles created by Western game companies, the game will also give you the option to be a good guy or a bad guy, and his choices will impact the world around him in a variety of ways as he progresses through the game. Oh, and did I mention it has glorious 2.5D side-scrolling sections based on classic Mickey toons? Well, now you know. This is actually the first Mickey Mouse platforming game released on a home console since the 16 bit era, which produced some of the best licensed software known to man. TMNT, Tiny Toons, and of course, Mickey Mouse games in those days were surprisingly high calibre compared to what would come later (see Capcom's GC Disney games), but I digress. In any case, those old platformers ROCKED, although they are much more in tune with the moder, warm-hearted version of Mickey. One particular memory I hold dearest to the black swirling void that I call my heart is World of Illusion Starring Mickey and Donald, which was one of the first games I've ever played. It is an experience that I have an intense longing to reacquaint myself with, especially now that there is more Mickey goodness to come at the end of the year. Well, I've blabbed on long enough. Time for bed. Edit- Errrr, I'm having a bit of trouble with the "embed video" feature.